October 27-31 – Our tenth annual Halloween dessert theater performance. Tickets now available via Brown Paper Tickets. 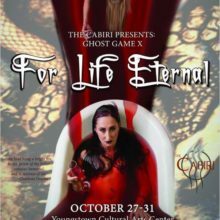 For Life Eternal is an evening of blood-curdling tales from folklore and mythology, along with delicious dessert featuring contemporary dance, aerial acrobatics, and storytelling as only the Cabiri can bring to life. For Life Eternal will feature live accompaniment by Sataray and celadon. For Life Eternal explores tales of creatures and beings who draw life from the living to sustain themselves. From the Transylvanian moroi to the legendary bloodbath-loving Hungarian queen Elizabeth Bathory, our five vignettes will revel in their thirst for blood. For Life Eternal will feature desserts from Seattle area bakeries and chocolatiers and a full bar including craft cocktails created especially for the event. On Halloween night, we will host a costume contest at intermission, with prizes awarded to the audience’s favorites. Dress to impress! Bring cash or Visa/MC/Discover to partake of festive libations including craft cocktails and the usual staples. For Life Eternal is appropriate for audience members 16 years and older. Festive attire encouraged.